The traditional ornaments in the farm house and the tree performance Narikizeme to pray for the good harvest in a new year. Free eating of Azuki-gayu, rice porridge with azuki beans and rice cakes. The Mamemaki performance and the Yaikagasi ornament to exterminate devils and diseases. the obon ornaments around the Butsudan in the Omoya farm house. The Otukimi ornaments ··· autumn vegetables with autumn wild flowers. Old & new hina dolls (called Ohinasan in the Asuke area) are exhibited in the houses along the old Asuke town streets as well as in the other spots like Asuke-yashiki. Doll decorations, shops and food stalls. Good for a half-day walk. 10am.-4am. 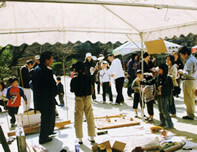 Handicraft shops, food stalls, activity tents and Japanese Drum performances, etc. in Korankei Hiroba. All day open during the golden week. The busiest month in Korankei & Asuke-yashiki. Korankei is a popular spot for viewing colorful autumn leaves. Starting mid to late November, MOMIJI (Koyo), that is colorful leaves, continues towards the beginning of December. 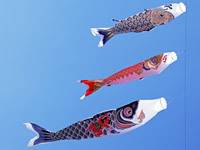 For the whole month of November, there are many things to see and do in Korankei. Handicraft shops, food stalls, activity tents and various performances every day. Lighting up maple trees from 5pm. to 9pm. Good for both day-time and night-time walks. The Chinese noodle Toshomen (sword grinding noodle) restaurant has been popular since 1988, cooked by Chinese chefs invited from Nanjing. Copyright (C) Sanshu Asuke Yashiki All Rights Reserved.